Relish Café and Bar (5625 Creedmoor Rd., Raleigh, N.C. 27612) I got the Vegetarian pimento cheese sandwich, which has cucumbers and roasted red peppers on wheat ($8.00) and is awesome. I love the addition of the crunchy cukes to this sandwich, which pairs great with Relish’s tomato soup. 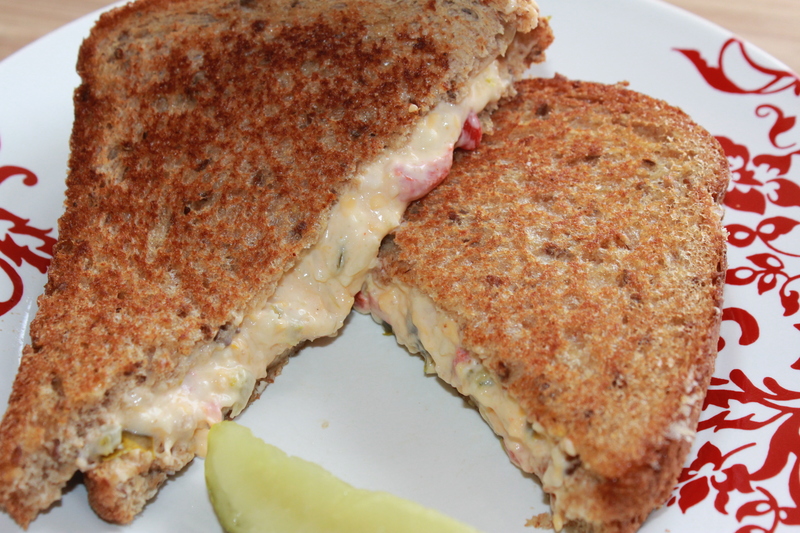 Pimento cheese is one of Relish’s specialties, and I can see why – owner/chef Sharon May does it right with her blend of Pepper Jack and cheddar cheeses, pimentos, red onions and a few other ingredients. Other items on the menu that have pimento cheese include more grilled sandwiches, the Old Southern burger and fritters. You also can get this served with crackers as an appetizer. Yum, yum, yum! Poppyseed Market Café & Wine Bar (8801 Lead Mine Rd., Raleigh, N.C. 27615) ($8.50) This sandwich is excellent but messy. Made with white cheddar and pimentos, there is no mayonnaise in this yummy pimento cheese, which has won chef Julia McGovern accolades. It’s amazing how creamy it is without the mayo. And the homemade chips that come with it are great! As usual, chef Julia delivers another home run with this specialty of the house. Nofo at the Pig (2014 Fairview Rd., Raleigh, N.C. 27608) ($8.50) This stuff rocks, and is made with Duke’s mayonnaise according to my server. I added the crispy bacon for an extra $1.00 – there was certainly lots of it. 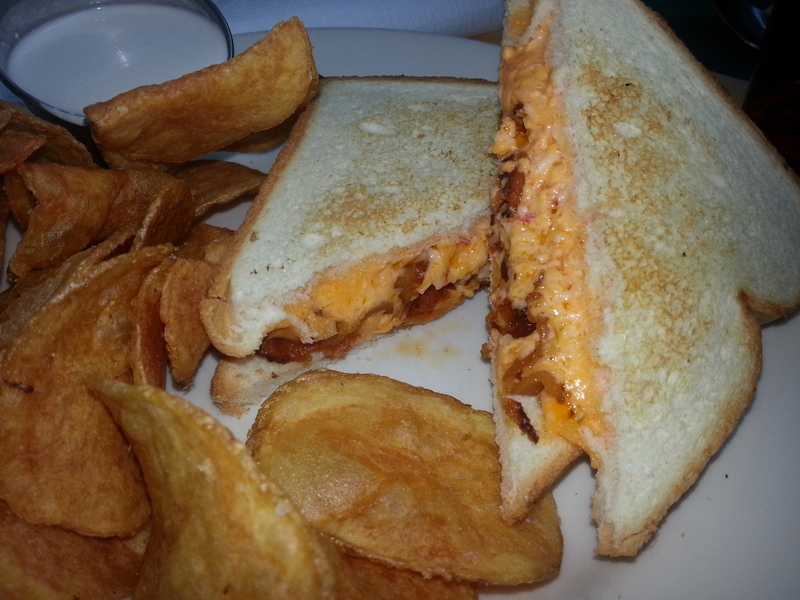 Pimento cheese and bacon, what can be better? Nofo’s recipe includes white and yellow cheddar, Duke’s mayo, fresh lime juice, salt, pepper and pimentos. Nofo sells this by the container upstairs in its gift shop. Boondini’s Sandwich Superstore (7403 Six Forks Rd., Raleigh, N.C. 27615) Boondini’s pimento cheese ($4.25) is excellent. 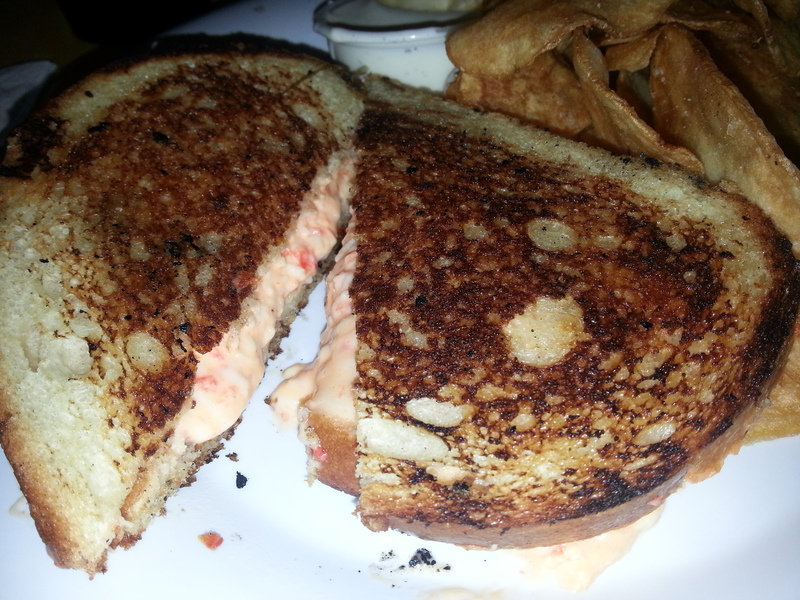 I chose the sourdough bread and received a perfectly grilled sandwich with a ton of pimento cheese. Nice and creamy, but definitely not too much mayonnaise. 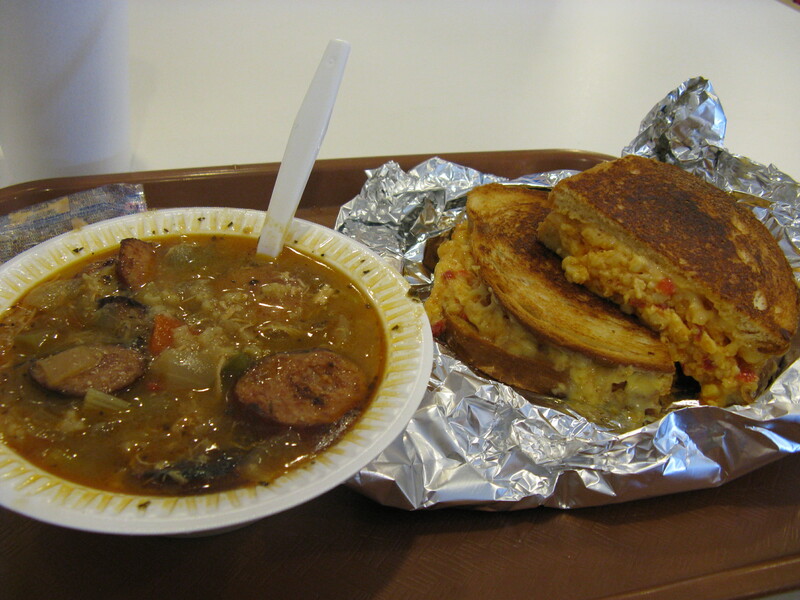 I recommend trying this sandwich with one of Boondini’s delicious homemade soups. Great food at a great price! Sunflower’s Café (8 W. Peace St., Raleigh, N.C. 27603) ($6.95) This grilled sandwich was very messy but very good. Sunflower’s pimento cheese is made with Pepper Jack, but it is not too spicy and has an excellent flavor. The sunflower bread that it comes on is great. Make sure you get extra napkins for this one! If you can’t get to one of these restaurants and don’t feel like making your own, you can pick up some tasty pimento cheese at Whole Foods Market, Earth Fare or The Fresh Market – all are quite good and will keep several days in your refrigerator. Another pimento cheese to try is Stan’s which is sold at Harris Teeter, Food Lion and Lowe’s. I have turned on people at work as well as family members to this delicious, less-expensive brand. Also, it is produced in our very own Burlington, NC. Thanks for the tip, Cathy! I will definitley give it a try. 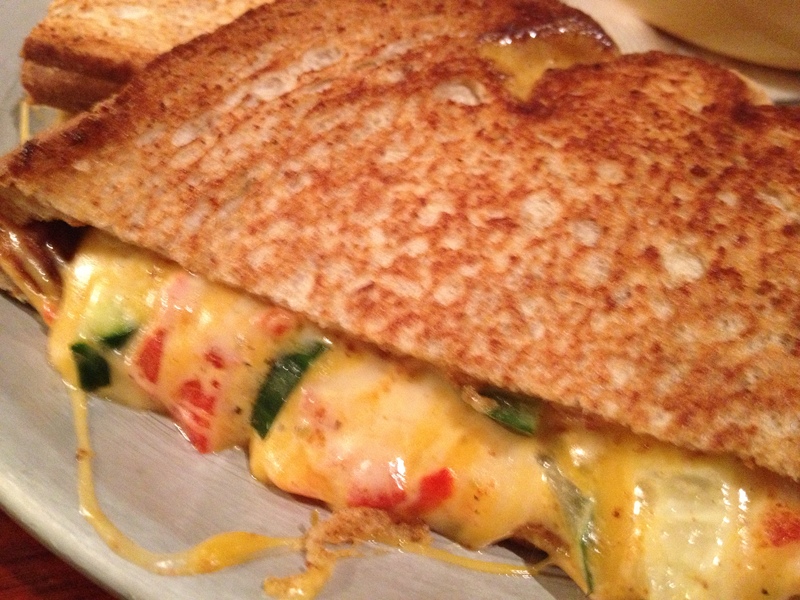 The Twisted Fork makes a delicious grilled pimento cheese sandwich as well. Can’t wait to try all the ones listed above. Thanks for the suggestion, Jess – I’ll give it a try next time I’m there! 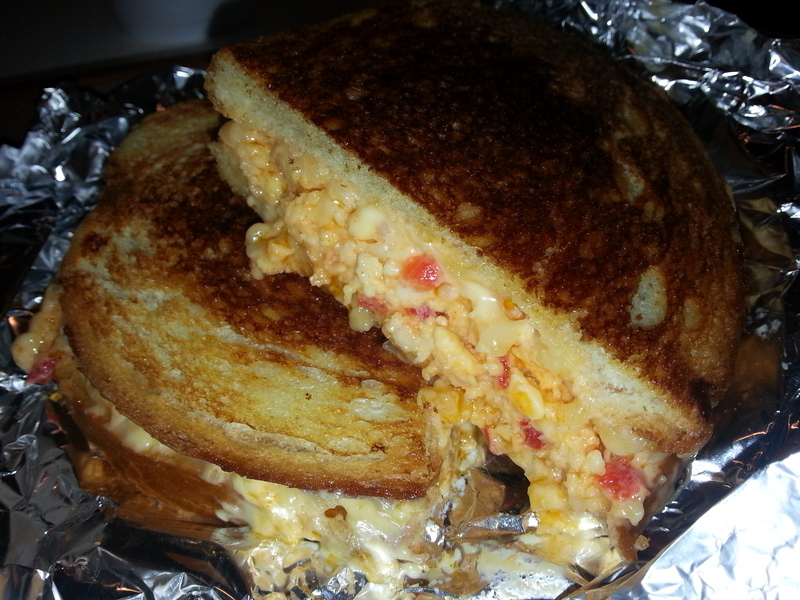 Relish also has some yummy pimento cheese, although parking is a pain with the real estate school next door. Looking forward to trying all of these, I love pimento cheese! Relish is wonderful! 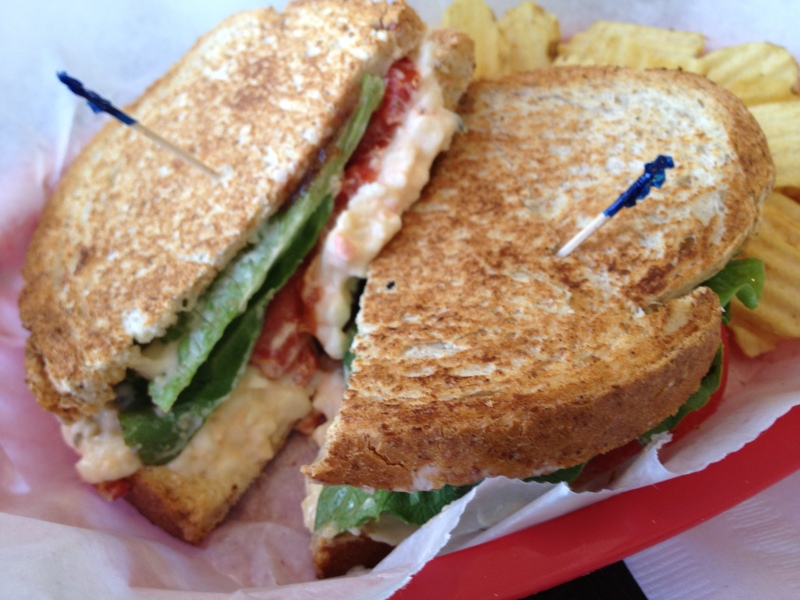 I also like its pimento cheese and fried green tomato sandwich – Southern to the core!